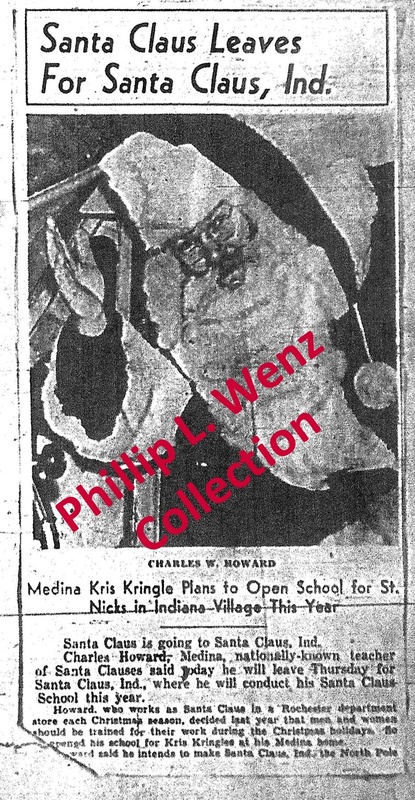 The only known meeting of Jim Yellig and Charles W. Howard, the two preeminent Santa’s of the twentith century, happened in October 1938 in Santa Claus, Indiana. Howard was teaching a Santa Claus School at the Candy Castle and Jim Yellig was becoming known as the Real Santa from Santa Claus. At the time, both of these men were just at the very beginning of what would become legendary and famed careers. 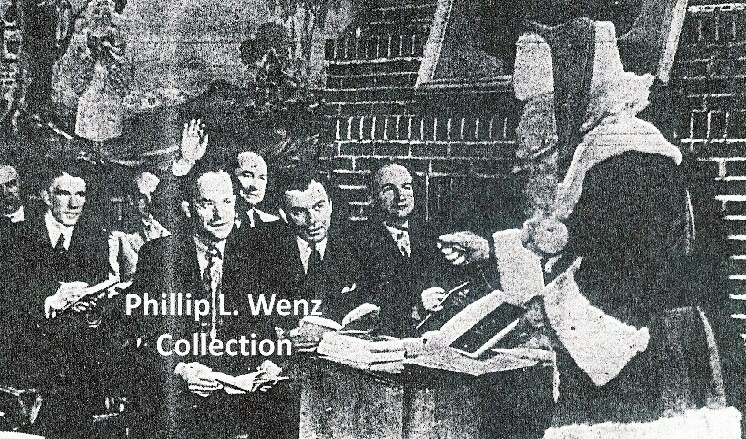 The above photograph shows Jim Yellig with his hand raised and Charles W. Howard in Santa regalia during a Santa seminar. It is the only known photo of both Yellig and Howard together. Charles W. Howard's professional career is that of a legend. He first played Santa as a boy in a classroom play. As an adult he found himself asked to help out a friend and play Santa in a store front window in downtown Albion. This experience helped Howard's urge to perfect the role of Santa Claus as much as he could. 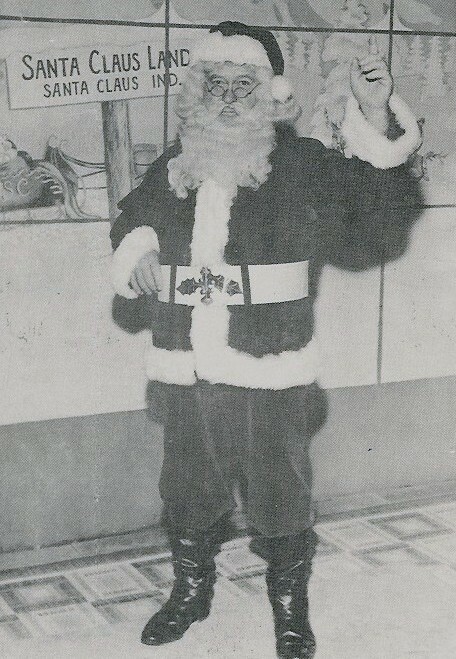 In his early career Howard caught the train next to his farm in Albion and commuted to Rochester and then Buffalo to be Santa in department stores. It was about this time he started to develop the idea for a "school" for Santas. Howard's first school was in the fall of 1937. Howard also appeared in the Macy's Thanksgiving Day Parade from 1948 through 1965. Oddly, he never worked as Santa in the New York City flagship store. From 1948-1964, Howard flew from New York City to Kansas City, Missouri to be the Santa at the Macy's store there. In 1965, his last Christmas season, Howard worked at Nieman Marcus in Dallas, Texas. One of the most beloved and legendary Santas of all time, Raymond Joseph Yellig (better known to his friends as Jim), was known as the “Real Santa” from Santa Claus, Indiana. Born in the small village of Mariah Hill, just a few miles north of Santa Claus, Yellig would become the face of Santa Claus, Indiana, for 54 years. Yellig appeared at Santa's Candy Castle and Santa Claus Town, the nation's first themed attraction, in the late 1930s. He answered children’s letters sent to the Santa Claus Post Office for over 50 years. A World War I veteran and an active Legionnaire, Yellig added to his fame by appearing in American Legion Christmas parades in New York City, Miami, Los Angeles and Philadelphia. In 1946, Yellig became the resident Santa at Santa Claus Land, the world’s first theme park. A position he held for 38 years. No Santa before or since has had as many children visit him in person as Santa Jim Yellig.